How to watch Pacquiao vs Mayweather fight live on your smartphone? Watch the Pacquiao-Mayweather Fight Live on your smartphone via Smart Livestream App for a limited-time price of Php499. Here's how to subscribe now? Watch Manny Pacquiao vs Floyd Mayweather in their “fight of the century” brawl straight on your smartphone! May 3rd will be an instant national holiday for boxing fans and all Filipinos in general as Manny "Pacman" Pacquiao and Floyd Mayweather finally agreed to settle everything in the same ring. All of us are pretty much excited to watch this historic fight live. However, if for some reason you could not watch it live on a big screen, worry not because you can still view it on-the-go using your smartphones. Here’s how. 1. Download Viewstream app on your Android smartphone. 2. Sign up using your Smart, Sun Cellular, or Talk ‘N Text number. 3. 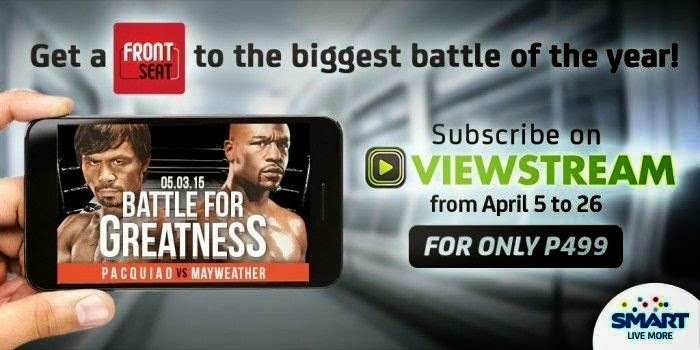 Subscribe to Pacquiao vs Mayweather livestream package for a limited time price offer of PhP 499 when you subscribe from April 5 to 26. Subscription can be paid using your prepaid load, or charge to your postpaid account. Make sure you have a reliable SMART 3G/4G connection or WiFi when you view the live streaming event. Standard data charges apply for prepaid mobile internet connection when livestreaming the Pacquiao vs Mayweather fight. 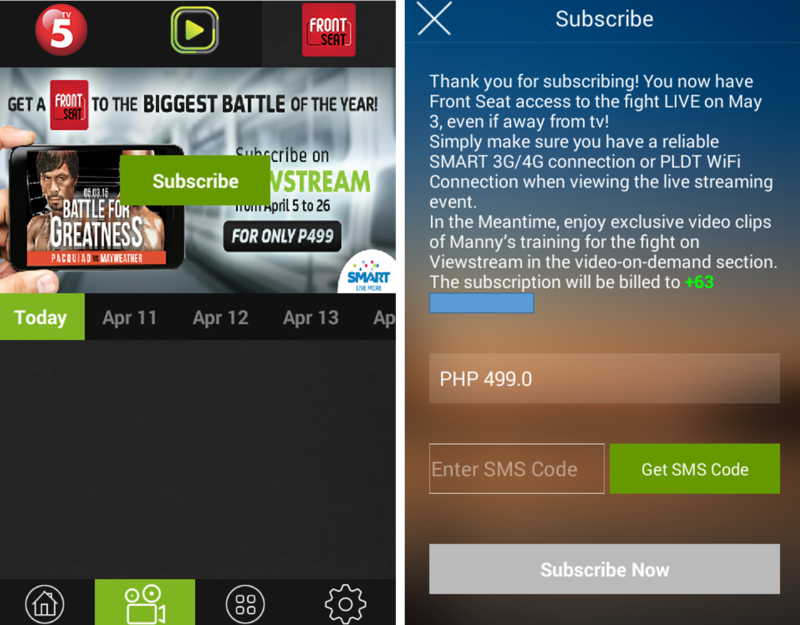 Pinoy Metro Geek: How to watch Pacquiao vs Mayweather fight live on your smartphone?